Memory impairments, such as dementia or Alzheimer’s disease, greatly alters quality of life, and as the symptoms progress, it can render people suffering from them completely dependant on those who care for them — which is why they require compassionate and kind care. 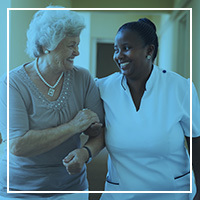 If patient-centered care in a facility that caters to Alzheimer’s and dementia patients is something that strikes a chord and beckons to you, at Serenity Gardens, we’re hiring! We are a small memory care facility that has opens our doors to 16 residents in various stages of dementia and Alzheimer’s disease. We have worked to offer a unique facility that provides an environment that is comfy and homelike, so the residents know they are home. In addition to a calm and cozy space, we prepare healthy and delicious meals, fun and engaging activities, and encouraging outings that uplift our residents. What makes our dementia care facility different? With a number of facilities and businesses you can add your skills and abilities to, Serenity Gardens is diverse in the level of care it provides. Alzheimer’s is a difficult disease that only progresses, and this is disheartening for anyone, but especially those living with it. At Serenity Gardens, we invite children and pets into our home to comfort and encourage them. There is nothing like the effervescence of a child or the intuitive loving nature of a dog. The support of family is critical when navigating dementia so we welcome families to be involved in their loved ones care, and we are also here to provide guidance to families in this heart-wrenching and difficult time. A professional is always available to discuss the resident and help make future plans. 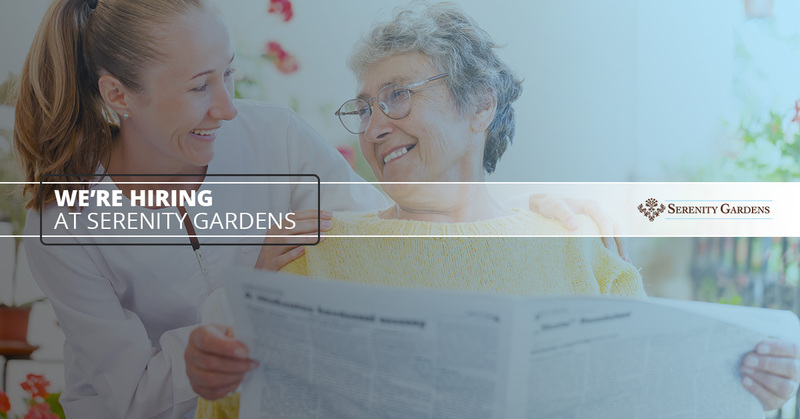 At Serenity Gardens, we incorporate a family-style dining experience to not only keep our residents healthy, but to build community in the facility and among residents. Here, the residents can engage in conversation, which helps them to not feel so isolated. Families are also invited to join in on meals to extend and enhance our community. It takes a great deal of active empathy to work at Spring Gardens. You’ll be working with residents in all different stages of dementia, which can be heartbreaking and frustrating all at the same time. People with dementia become easily confused and dissociated, so it will be up to you to meet them where they’re at with openness and with an understanding of what they’re going through. Because the residents depend on you for their basic needs, we need someone who is consistent and will show up ready to engage on a daily basis. A person living with dementia will become more and more dependent, so you will need to be more flexible and learn to pivot your interactions and help de-escalate situations. If memory care is a career path you’re looking to get into, consider joining our team at Spring gardens!